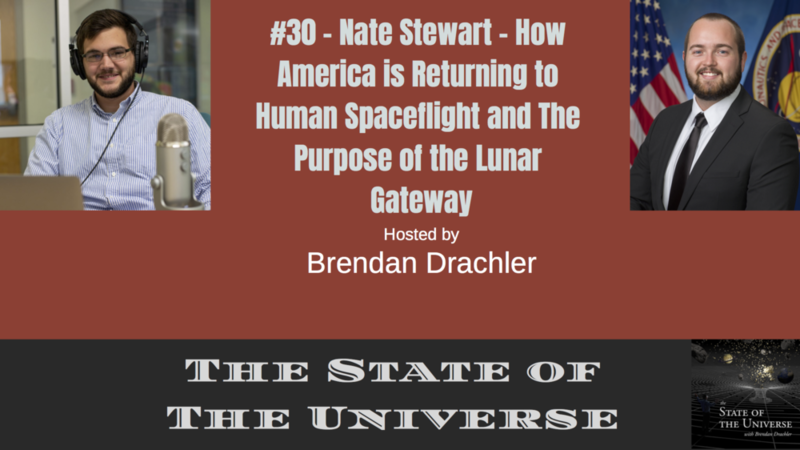 This week Brendan sits down with Nate Stewart to discuss America's return to human spaceflight, the pros and cons of establishing a lunar gateway, getting to Mars, the death of the Opportunity rover, and much more! Be sure to support the show by leaving a rating or a review and subscribing to receive future content. Consider becoming a Patron by donating to the show on Patreon at https://www.patreon.com/thestateoftheuniverse. For more episodes or information about "The State of The Universe with Brendan Drachler" visit thestateoftheuniverse.com or follow Brendan on Twitter and Instagram @BrendanDrachler. The State of the Universe is an accessible science and social podcast hosted by Astrophysicist Brendan Drachler. Listen to Brendan and other renowned members of society discuss and explain cutting edge research and profound ideas. Brendan sits down with Dr. Priya Natarajan. Dr. Natarajan is a theoretical astrophysicist interested in cosmology, gravitational lensing and black hole physics. In particular, she has focused on making dark matter maps of clusters of galaxies, the largest known repositories of dark matter. Priya recently authored the book Mapping the Heavens: The Radical Scientific Ideas That Reveal the Cosmos. She is also on the scientific advisory board of Nova ScienceNow. Her book can be found on Amazon and her profile can be found at http://www.astro.yale.edu/priya/. Follow her on social media @SheerPriya. Brendan sits down with Dr. Peter Barlow. Dr. Peter Barlow is an Associate Professor of Immunology and Infection, and Director of Research of the School of Applied Sciences at Edinburgh Napier University, Scotland, UK. Peter previously worked within the Influenza Division of the US Centers for Disease Control & Prevention (CDC). Peter has been seen on ABC News, NBC News, Fox News, and many other media outlets. Peter's website can be found at http://www.barlowlab.com/. He can be found on social media @drpeterbarlow. Rich, Brenda, Rachel for contributing to this episode. Consider supporting the show by leaving a rating or a review and subscribing to receive future content. Consider becoming a Patron by donating to the show on Patreon at https://www.patreon.com/thestateoftheuniverse. For more episodes or information about "The State of The Universe with Brendan Drachler" visit thestateoftheuniverse.com or follow Brendan on Twitter and Instagram @BrendanDrachler. #27 - Dr. Julia Young - How History Can Help Us Understand Modern Immigration to the U.S. This week on TSOTU Brendan is joined by Dr. Julia Young. Dr. Young is a historian of migration. Her prize-winning book, Mexican Exodus: Emigrants, Exiles, and Refugees of the Cristero War (Oxford University Press, 2015), examines Mexican religious exiles, political refugees, and labor emigrants in the United States during Mexico’s Cristero war. She has published scholarly articles in The Americas, The Catholic Historical Review, Mexican Studies/Estudios Mexicanos, and the Journal on Migration and Human Security. Dr. Young has been a fellow at the Kluge Center at the Library of Congress, as well as the Institute for Policy Research at Catholic University She is currently researching a new book about right-wing Catholicism in Mexico during the twentieth century, and she frequently writes for the media about immigration, border issues, and Catholic immigration history. She is also a frequent contributor to the Washington Post. In this episode, Brendan is interviewed on the Kev Baker Show. He discusses Black Holes, Aliens, Fast Radio Bursts, and Flat Earthers. The Kev Baker Show is a very popular radio show/podcast. Kev has nearly 100,000 subscribers on his Youtube Channel found at https://www.youtube.com/user/TruthTube451. His show can also be found on most podcasting platforms. This episode will not be available on my Youtube channel. But… It is available on Kev Baker’s Youtube channel. In this episode, Brendan talks about wrecking his car in a blizzard, supermassive black holes, neutron stars, quasars, and how our understanding of black holes has changed over decades. For more episodes or information about "The State of The Universe with Brendan Drachler" visit thestateoftheuniverse.com or follow Brendan on Twitter and Instagram @BrendanDrachler. This week Brendan and Nate sit down to discuss climate change data for all of 2018, the temporarily shutdown Hubble Space Telescope camera, fast radio bursts, and utilizing Donald Trump's wall for energy generation. This week Brendan and Nate sit down to discuss the recent Chinese moon mission Chang'e 4, the impact of government shutdowns on science, the ISS hole, New Horizons, and a bunch of other stuff. This week's episode features Dr. Aysha Akhtar. Aysha Akhtar, M.D., M.P.H., is a double Board-certified neurologist and preventive medicine/public health specialist and she is demonstrating how there is a mutual benefit to both humans and animals when animals are cared for. She is the author of the upcoming book, Our Symphony With Animals. On Health, Empathy, and Our Shared Destinies. The book can be purchased here. Dr. Akhtar's website can be found here. Water usage calculator can be found at https://www.nationalgeographic.com/environment/freshwater/water-conservation-tips/. Information can found at Ag-gag laws can be found at https://www.theatlantic.com/health/archive/2012/03/the-ag-gag-laws-hiding-factory-farm-abuses-from-public-scrutiny/254674/. The amount of water used in industry and agriculture can be found at https://waterfootprint.org/en/resources/waterstat/product-water-footprint-statistics/. 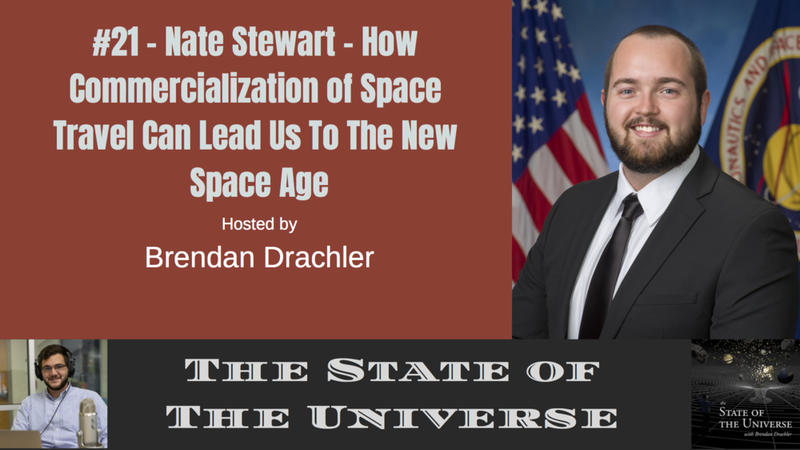 In this episode, Brendan sits down with spaceflight expert Nate Stewart. They explore how commercialization of spaceflight will lead to advancements in space exploration during our lifetime. The Falcon 9 water landing video referenced in the conversation can be found at https://www.youtube.com/watch?v=LFdep0qCmYA.